The Ohio State University Marching Band Alumni will present a “Summer Concert” on July 12 at the Kenyon College Athletic Complex-Toan Indoor Track in Gambier, Ohio. GAMBIER – The Ohio State University Marching Band Alumni will present a “Summer Concert” on July 12 at the Kenyon College Athletic Complex-Toan Indoor Track in Gambier, Ohio. This concert is a free event, and will be performed by 80 plus members of the OSU Marching Band Alumni. The doors will open at 4:30 pm for “first-come…first-serve” seating in the air conditioned indoor track facility. A “Tailgate-style” food service featuring brats, hot dogs, potato chips, and Velvet ice cream will be provided from 4:30 – 5:30 pm with proceeds benefiting the OSU Alumni Club of Knox County. The Marching Band Alumni will perform from 5:30 – 7:30 pm. 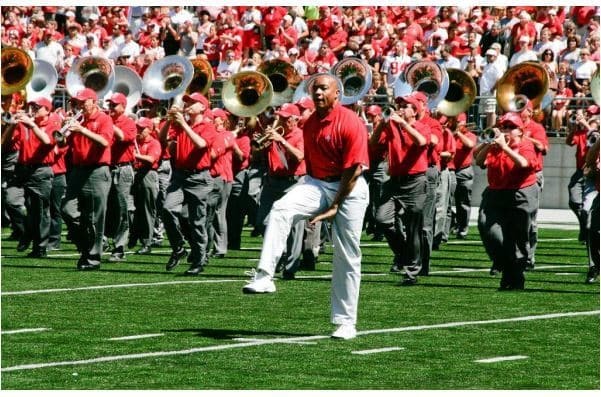 The Ohio State University Marching Band Alumni is the largest all brass and percussion alumni band in the United States. The group is comprised of former members of the Ohio State University Marching Band, which is steeped in military tradition and whose instrumentation is patterned after the traditional British Brass Band. The admirable reputation and diverse nature of the group has led to participation in the St. Patrick’s Day Parade in Dublin, Ireland, a performance tour of Germany, a visit to Osaka, Japan and a trip to Hawaii to entertain US Naval personnel based at Pearl Harbor. The Band just returned from performing in the D-Day Memorial Celebration in France. Whether marching in a parade, performing a summer concert in the park, or entertaining guests at a wedding, the Ohio State University Marching Band Alumni take great pride in delivering a superb quality musical and marching performance rooted in the style and excellence of the Ohio State University Marching Band, better known in the U.S. as “The Best Damn Band in the Land” (TBDBITL). This concert is being sponsored by the OSU Alumni Club of Knox County, with co-sponsor support from the Community Foundation of Mount Vernon and Knox County, Ariel Corporation, CES Credit Union, and Velvet Ice Cream. Attendees will be encouraged to make a donation to the Scholarship Fund of the OSU Alumni Club of Knox County. “As a partner with the OSU Alumni Club in raising, investing, and awarding scholarship dollars, The Community Foundation of Mount Vernon & Knox County is pleased to co-sponsor events which provide quality family entertainment while supporting the education goals of local students”, said Sam Barone, Executive Director of the Community Foundation of Mount Vernon & Knox County.